Try this vinaigrette made with Bigelow Earl Grey Tea on your asparagus for a healthy side dish. 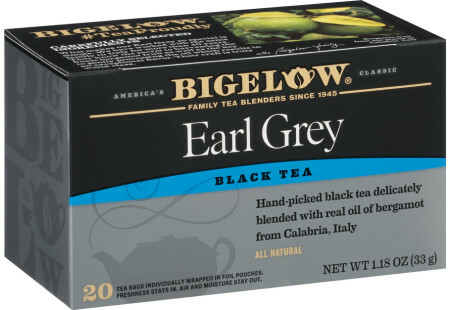 To make the vinaigrette, boil water and add 2 Bigelow Earl Grey Tea Bags to ½ cup water. Steep for 5 minutes; remove bags and reserve tea. Place tea, orange juice and sugar in a small saucepan or skillet and bring to a boil, reduce to about 2 tablespoons (30mL). Combine tea mixture, vinegar, garlic, salt, pepper and sesame oil together. Bring a saucepan of water to a boil, add asparagus and blanch for 1-2 minutes. Rinse with cold water. Arrange asparagus with julienned red pepper in an attractive platter and toss with Earl Grey Vinaigrette. Garnish with chopped egg. May we suggest Green Tea with Mango - Case of 6 boxes - total of 120 teabags to pair with this recipe?